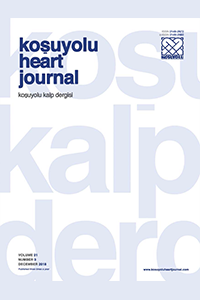 Koşuyolu Heart Journal is a peer-reviewed, open access journal that has been published three times a year in April, August and December. This is the scientific journal of the Health Sciences University, Koşuyolu High Specialization Health Application and Research Center (namely in Turkish, Sağlık Bilimleri Üniversitesi, Kartal Koşuyolu Yüksek İhtisas Sağlık Uygulama ve Araştırma Merkezi, İstanbul, Türkiye). The official languages of the journal are English and Turkish. The aim of the Koşuyolu Heart Journal; is to present advances in the field of cardiology, cardiovascular surgery, congenital cardiac surgery, and cardiovascular anesthesia to the readers. Koşuyolu Heart Journal publishes research articles, reviews, original case reports and images, letters, and critiques on cardiovascular medicine. The target reader population are the doctors specialized to the cardiovascular medicine. As an open access journal, all content is freely available. Koşuyolu Heart Journal currently has an acceptance rate of 48%. The average time between submission and final decision is 30 days and the average time between acceptance and final printed publication is 60 weeks. However, provisional copy of submissions are published online within 1 month after acceptance.